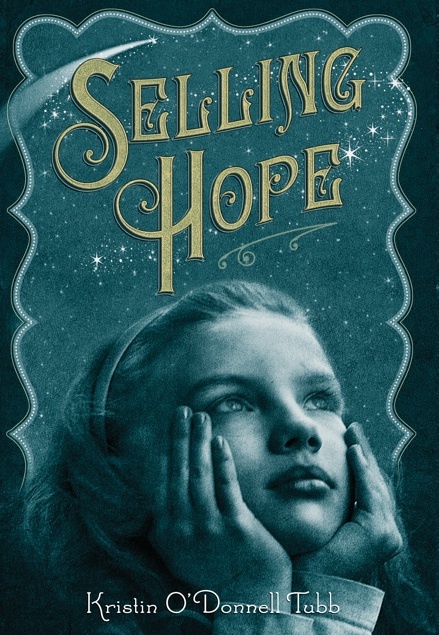 Selling Hope by Kristin O'Donnell Tubb. (Grades 4-8.) Feiwel & Friends, November 2010. 215 pages. Reviewed from ARC provided by publisher. It's 1910, the Earth is about to pass through the tail of Halley's Comet, and Everyone Is Freaking Out. Newspaper headlines shout about how the world is going to end and all Hope wants is a different life. She and her father perform a magic act with a small-time vaudeville show, constantly traveling, staying in run-down boarding houses, performing illusions. She longs to settle down in a house, to make friends, to leave the vaudeville circuit forever. But to have a different life, she's going to need money. So Hope starts selling anti-comet pills to gullible customers outside the theater. Can Hope make enough money to make her dreams come true? And with the world ending in a matter of days, is she cheating people or is she offering them something more valuable than money - hope? Ohhh, how I liked this book! "To Escape the Comet, Hire Submarine Boat"
"Hey! Look Out! The Comet's Tail is Coming Fast!" "Citizens Flocking into Chicago, Fear the End of the World"
From vaudeville to Sen-Sen "breath perfumes" to wisecrack jokes to nickelodeon movies, Kristin O'Donnell Tubb is extremely effective at setting the scene and mood. Hope is an engaging character dealing with much more than the potential end of the world. Her mother died because they didn't have money for a doctor, so she's fairly obsessed with lining her purse at every opportunity. Her father is not much of a father figure, preferring to think of them as "equals" and blithely ignoring everyday practicalities like saving money. He's perfectly content to perform his illusions and attempt to educate crowds by reciting Whitman at their shows, oblivious to the fact that Hope hates it. As a result, Hope's raising herself and she's grown up fast. She's only 13, but she's the one planning for their future. This is a story about hope for the future when that hope might be all you have. And what people are willing to do to preserve that hope. And it's a story about fathers and daughters and growing up and being in-between childish impulses and grown-up decisions. And of course, I can't fail to mention the author's note. Ms. Tubb speaks about the historic appearance of Halley's Comet and how it affected the people of the time. She also talks about vaudeville and the real people that appear in the story. She includes a nice list of recommended reading, providing resources for anyone who's interest is piqued by the story (and believe me, there will be many of those!). Read more reviews at Ms. Martin Teaches Media and Shannon Whitney Messenger's blog. Selling Hope will be on shelves November 9.